Looking back on the evolution of the movie trailer we must consider the evolution of how we watch movies. Unlike the multiplexes we’re accustomed to today, the first movie theaters in the 1910s had only one screen. You would pay the admission, say five cents, and you could sit in the theater for as long as you wanted. Show times weren’t precise – a feature length movie along with a short films and a cartoon would play in a continuous loop and you could watch it as many times as you wanted. 1913 would be what many historians consider year zero for the movie trailer. In New York City, Nils Granlund, advertising manager of Marcus Loew theaters, made a short little promotional film for the Broadway play “Pleasure Seekers” showcasing actual rehearsal footage. The idea of showing ads between films was a hit – at least to the movie theater owners – The practice of creating and splicing in promotional pieces into the screening rotation was quickly implemented by the Loew theater chain as well as others. Around the same time in Chicago, Col. William Selig, one of film’s earliest pioneers, would engineer another way to get audiences to the movies. Selig noticed the popularity of print serials in newspapers so he approached the Chicago Tribune, a newspaper embattled in a circulation war for who could be the most sensationalist, to adapt a film version of a print serial. The result was a 13 episode serial entitled “The Adventures of Kathlyn”. This wasn’t the first film serial, it was actually the second; but it introduced a new device to film marketing. You see, each week a new installment would debut along with an article in the Chicago Tribune that continuing the story. What made “The Adventures of Kathlyn” different was at the end of each installment something would happen to put the characters in some sort of peril – a cliffhanger often with a title card inviting patrons to come back the following week to see what happens. 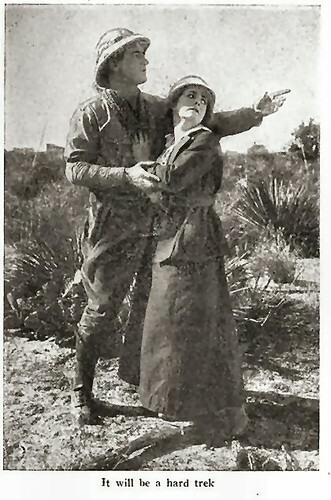 So Thus the idea of the trailer was born – and so too the term – as these promotions for upcoming attractions would play at the end of the film – hence trailer. As we contemplate coming attractions, we might recall that it was on this date in 1927 that the first organizational meeting of the Academy of Motion Picture Arts and Sciences was convened by Louis B. Mayer, the head of MGM. The 230 charter members elected Douglas Fairbanks, Sr. the group’s first president. Mayer’s original intent was to provide a forum for labor mediation and to improve the industry’s image; the first of those goals never got traction, so the second– the burnishing of Hollywood’s star– became the group’s primary focus. 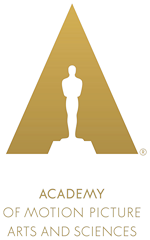 By 1929, the AMPAS had established the Academy Awards, and had joined with the University of Southern California to create the first film school. The average spending last year. This year’s figure is an 11 percent increase. As we reassure ourselves that it’s the thought that counts, we might send nonsensical birthday greetings to Edward Lear; he was born on this date in 1812. An accomplished “ornithological draughtsman,” Lear published his first work– Illustrations of the Family of Psittacidae, or Parrots— at age 19, a collection that was favorably compared to the work of Audubon. But Lear is better remembered for his verse (and the illustrations he supplied to accompany it). In 1846 he published A Book of Nonsense, a volume of limericks helped popularise the form. In 1865 The History of the Seven Families of the Lake Pipple-Popple was published; and in 1867 his most famous piece of nonsense, The Owl and the Pussycat (which he wrote for the children of his patron Edward Stanley, 13th Earl of Derby). They were quite successful, and any other works followed. Lear’s facility– his verbal inventiveness, his knowing liberties with poetic form– led many to suspect (a la Shakespeare) that his poems were actually the work of another, better-educated author: his patron. 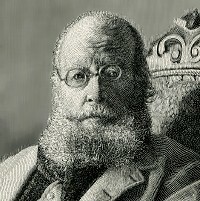 (Conspiracy theorists noted that “Lear” is an anagram of “Earl”– so that “Edward Lear” might be code for “Edward, Earl”). But Lear was real enough, and earned his place– alongside Lewis Carroll and W.S. Gilbert– as one of the great purveyors of nonsense of the Victorian Age. As (R)D readers know, Randall Munroe’s xkcd webcomic has done some weird and wonderful things before (e.g., here and here), but #1190, ‘Time,” is something special. A time-lapse movie of two people building a sandcastle, it’s been updating just once an hour (twice an hour in the beginning) for well over a month (since March 25th)– and after over a thousand frames shows no sign of ending. Any day now, the number of frames will surpass the total number of xkcd comics. Some of its readers have called it the One True Comic; others, a MMONS (Massively Multiplayer Online Nerd Sniping). It’s sparked its own wiki, its own jargon (Timewaiters, newpix, Blitzgirling), and a thread on the xkcd user forum that runs to over 20,000 posts from 1100 distinct posters. So, is ‘Time” a mesmerizing work of art, a penetrating sociological experiment — or the longest-running shaggy-dog joke in history? Randall Munroe’s not saying. 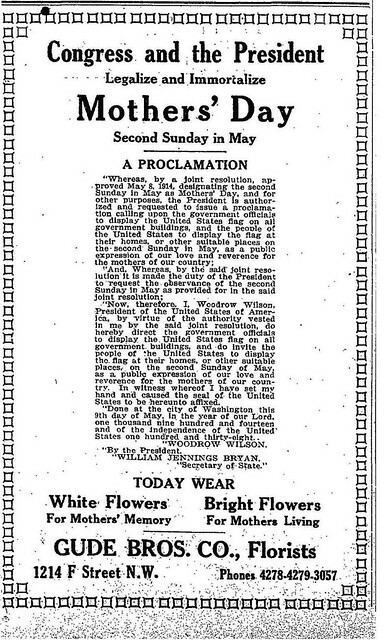 As we remember that at least some things come to those who wait, we might also recall that it was on this date in 1914 that President Woodrow Wilson proclaimed Mother’s Day– the second Sunday in May– as a day for Americans to show the flag in honor of those mothers whose sons had died in war. The drive to found the holiday came from Anna Jarvis (in honor of her mother, Ann, who had tried to start a “Mother’s Remembrance Day” in the mid-19th century). In 1905, Jarvis enlisted the support of merchant extraordinaire John Wanamaker, who knew a merchandising opportunity when he saw one, and who hosted the first Mother’s Day ceremonies in his Philadelphia emporium’s auditorium. In 1912, Jarvis trademarked the phrases “second Sunday in May” and “Mother’s Day”*, and created the Mother’s Day International Association. By 1914, Jarvis and Wanamaker had built sufficient support in Congress to a get Congressional Resolution requesting the President’s action. Wilson, who was by current accounts uninterested in the move (distracted as he was by the beginnings of his ultimately unsuccessful effort to keep the U.S. out of the troubles in Europe that became World War I), nonetheless knew better than to take a stand against moms. 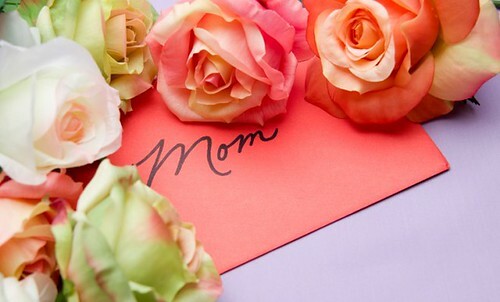 So readers should remember that there are only three shopping days (counting today) before this year’s Mother’s Day.